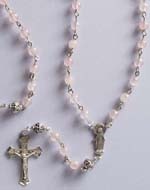 offers the finest quality handcrafted Gemstone Rosaries, Rosary Necklace s, Rosary Bracelet s, Peace Rosaries and Child's Rosaries, Child's Chaplets and Catholic Jewelry. 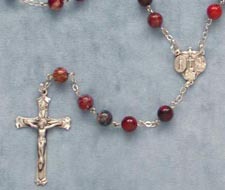 Our heirloom quality rosaries are crafted in sterling silver by hand from a selection of semi precious gemstones from around the world with hand tooled sterling silver crucifix and centers. 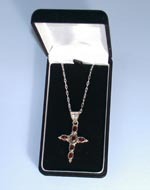 Our unique Rosary Necklaces have intricately handcrafted sterling silver inlaid stone crosses and beads designed in Bali, Thailand and Nepal. 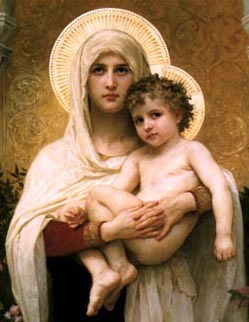 Prayerful attention is given in the creation of each rosary with dedication to the path of Peace. Our gemstone Rosaries are lovingly handcrafted in Santa Cruz, California by Cynthia Ratliff, a devotee of Holy Mother Mary. In her service to the divine mother, Cynthia has created this Rosary ministry and a non profit organization (NGO) "For The Children ", in service to marginalized children around the world since 1992. 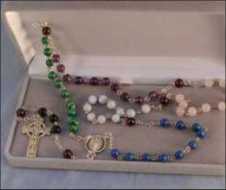 Profits from Mother Mary's Rosaries supports . Orders ship within 1 to 5 days unless rush order requested.